I was pretty surprised that the SCAR rifle found a way to once again sneak into my life, and it caused me to think for a moment and realize that this rifle appears in almost every game I love, though it’s never as flashy as the AK-47 or as popular as the other rifles in its category. One of the cool things about the SCAR rifle is its bulky, blocky frame that advertises its weight. Unlike more streamlined rifles like the M16 or AK families, the SCAR looks heavy and powerful, so developers usually make it a heavy-hitter with penalties to firing speed, movement speed or reload time. This is the angle Payday 2 took with the SCAR when they added it to the very first DLC weapon pack ever as the Eagle Heavy rifle. I could talk about stats and stuff right here, but long story short there are so many different assault rifles in Payday 2 by now that the Eagle Heavy only holds one specific niche use due to the fact that it uncommonly holds no reputation requirements. As the most powerful primary weapon available for level 0 heisters, I keep one in my inventory for whenever I just went infamous and haven’t unlocked any other guns in the game. It’s also one of the few DLC weapons wielded by enemies, specifically Murkywater mercenaries. 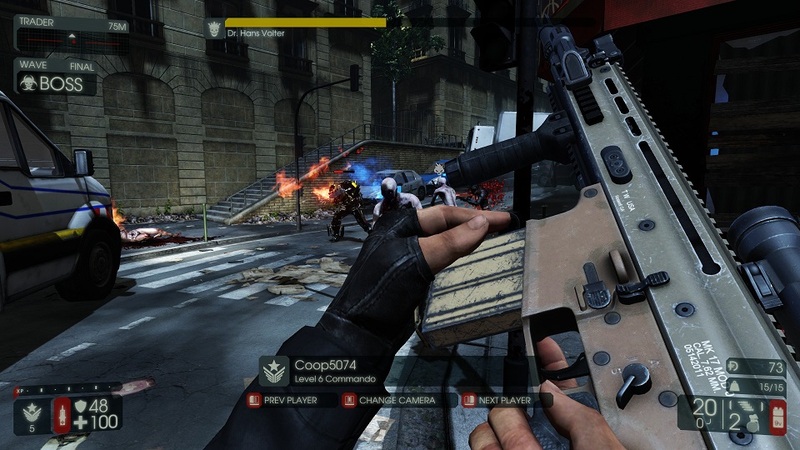 Killing Floor 2 also takes this approach to the SCAR, making it the most powerful (and expensive) weapon available to the rifle-oriented Commando class. As it could toggle between firing types, my preferred playstyle was to set it to semi-auto and be the team’s sniper, especially considering there was no Sharpshooter class until quite recently. Despite this, it wasn’t actually the most popular rifle in its class, with many players choosing to stick with the AK12 due to its lessened cost, more manageable recoil and general versatility. This distinction has only grown with the release of an actual sharpshooter class with weapons far more specialized for long-range combat. But for a time it was the only thing we snipers had. 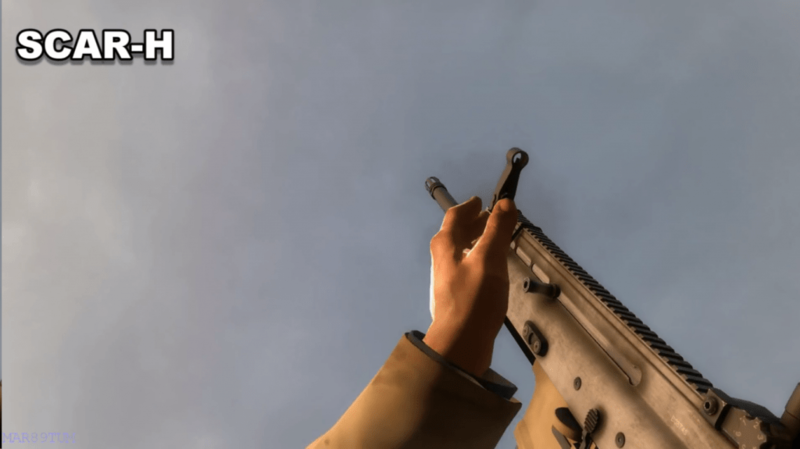 Speaking of sniping with SCARs, many developers reach the logical conclusion that a heavy-hitting, slow reload assault rifle sounds suspiciously like a sniper rifle, and use the SCAR as a sort of middle ground between the two. 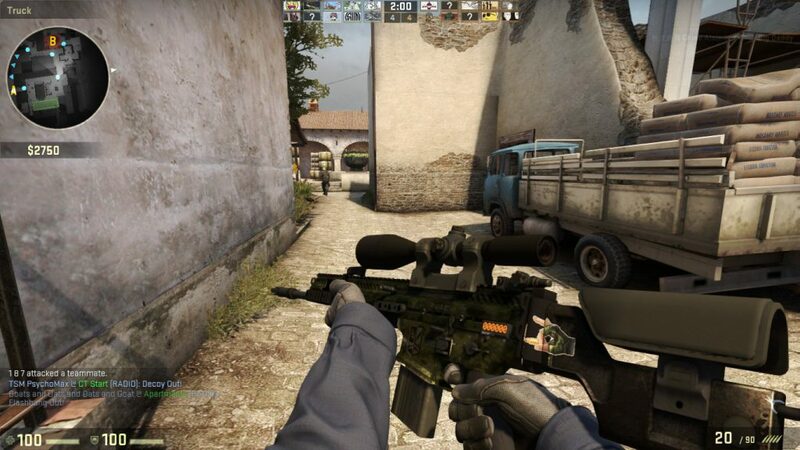 The SCAR-L in Counter-Strike Global Offensive is the counter-terrorist automatic sniper rifle, capable of dealing powerful headshots almost as quickly as the player can pull the trigger. Since it comes with a faster reload than its terrorist equivalent, its one of the most versatile and easiest weapons in the game to use, though because of this it’s widely hated by players. It also makes very rare appearances in competitive CSGO due to its hefty $5000 cost and the sheer power of the full-auto rifles, not to mention it cannot kill with a single bodyshot like the AWP can. But of all the SCARs I see in gaming, the one that comes to my mind first is the Combat Rifle from Left 4 Dead 2 due to being one of three available choices in my favorite weapon category. The Combat Rifle is actually kind bizarre due to being the only 3-burst weapon in the game. Said bullets are low-damage but incredibly accurate, which coupled with the agonizingly slow reload give the gun the feeling of a sniper rifle. Personally I’m not a huge fan and traditionally I usually just keep my SMG if the SCAR is the first Tier 2 weapon the campaign presents me. The mandatory 3-burst fire can get really annoying and I wish the gun had the ability to toggle to semi-auto, especially because L4D2 otherwise has no semi-auto rifle. Technically you can melee shove after the first shot leaves the barrel and it’ll be a semi-auto rifle, but that just adds to the clunkiness of this poor rifle. And that’s kinda the melancholy state of the SCAR. While it’s very attractive to devs due to its recognizable appearance and association with special forces, it’s rarely the most popular gun in any particular game and is often overshadowed by flashier or more versatile options due to often being a rather specialized option in a generalist weapon category. Even my brother admits he sometimes uses his Tommy gun just because its way more awesome and it makes his airsoft friends jealous. Alas. Next Next post: Summer Games Hit Overwatch!